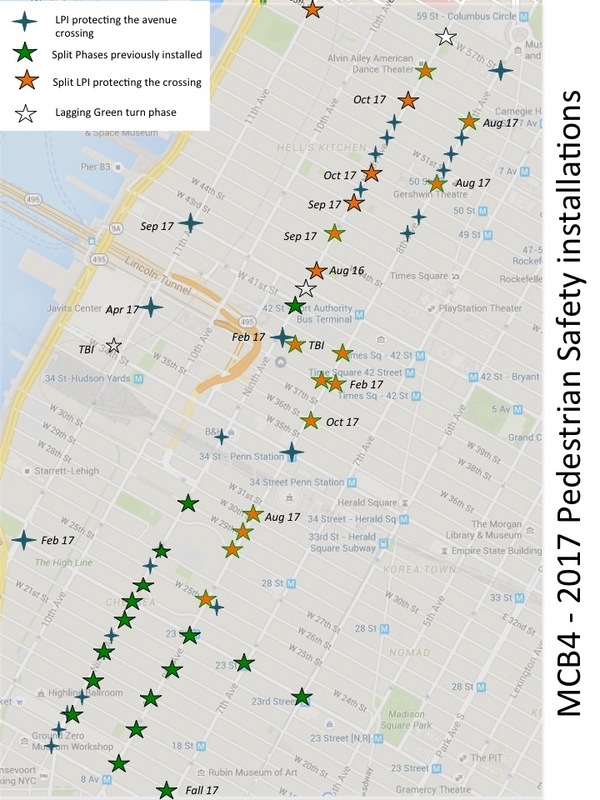 Pedestrian Safety: 10 More Intersections Protected in 2017! Just in 2017 , DOT has added 10 new split LPIs to protect pedestrians who cross the avenues. A split LPI is a red arrow for turning cars which gives exclusive right of way to the pedestrians, followed by a blinking yellow arrow which puts drivers on notice to slow down and yield. LPIs – which delays the start of all traffic ( turning and through) were installed at 3 locations . Such installation has been very successful in our district notably at 43rd and 9th Avenue . We are delighted that our Hell’s Kitchen Transportation Study is yielding so much safety at dangerous intersections . Our next goal is to tackle the big complicated intersections ( 42/8, 57/8, 57/10 ) and get them fixed. Already DOT notified us that the 57/8 intersection is included in a study of Columbus Circle that will be completed in January 2018. This is progress. This entry was posted in Complete Streets, pedestrian, Traffic Justice and tagged crashes, pedestrian, safety. Bookmark the permalink.